Mudbrick was used for the construction of Elamite ziggurats—some of the world's largest and oldest constructions. Choqa Zanbil, a 13th-century BC ziggurat in Iran, is similarly constructed from clay bricks combined with burnt bricks. A mudbrick or mud-brick is an air-dried brick, made of a mixture of loam, mud, sand and water mixed with a binding material such as rice husks or straw. Though mudbricks are known from 7000-6000 BCE, since 4000 BC, bricks have also been fired, to increase their strength and durability. In warm regions with very little timber available to fuel a kiln, bricks were generally sun dried. 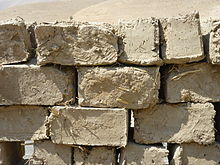 In some cases, brickmakers extended the life of mud bricks by putting fired bricks on top or covering them with stucco. The South Asian inhabitants of Mehrgarh constructed and lived in mud-brick houses between 7000–3300 BC. Mud bricks were used at more than 15 reported sites attributed to the 3rd millennium BC in the ancient Indus Valley Civilization. In the Mature Harappan phase fired bricks were used. Mudbricks were adopted in the Middle East from Indus Valley Cities during the Pre-Pottery Neolithic B period. The Mesopotamians used sun-dried bricks in their city construction;  typically these bricks were flat on the bottom and curved on the top, called plano-convex mud bricks. Some were formed in a square mould and rounded so that the middle was thicker than the ends. In Minoan Crete, at the Knossos site, there is archaeological evidence that sun-dried bricks were used in the Neolithic period (prior to 3400 BC). In Ancient Egypt, workers gathered mud from the Nile river and poured it into a pit. Workers then tramped on the mud while straw was added to solidify the mold. 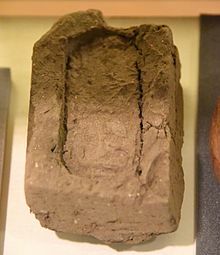 The mudbricks were chemically suitable as fertilizer, leading to the destruction of many ancient Egyptian ruins, such as at Edfu. A well-preserved site is Amarna. Mudbrick use increased at the time of Roman influence. In areas of Spanish influence, mud-brick construction is called adobe, and developed over time into a complete system of wall protection, flat roofing and finishes which in modern English usage is often referred to as adobe style, regardless of the construction method. The Great Mosque of Djenné is a well-known Mosque located in Djenné, Mali, and the largest mudbrick structure in the world. 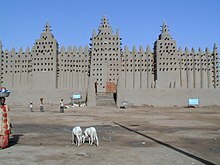 The Great Mosque of Djenné, in central Mali, is the world's largest mudbrick structure. It, like much Sahelian architecture, is built with a mudbrick called Banco, a recipe of mud and grain husks, fermented, and either formed into bricks or applied on surfaces as a plaster like paste in broad strokes. This plaster must be reapplied annually. Production of mudbricks for construction in Niger, 2007. Mudbrick is still used today, as seen here in the Romania Danube River Delta. The "Old Town" area of Zinder, Niger, with traditional painted mudbrick buildings. A Punjabi mudbrick home in Pakistan. Mudbrick high-rises in Shibam, Yemen. Earth structure – A building or other structure made largely from soil. ^ Hawkes, Jacquetta (1974). Atlas of Ancient Archaeology. McGraw-Hill Book Company. p. 146. ISBN 0-07-027293-X. ^ SACKO, Oussouby (15 November 2015). "Issues of Cultural Conservation and Tourism Development in the Process of World Heritage Preservation" (PDF). Area Studies. Retrieved 7 October 2016. ^ Bradbury, Dominic (30 October 2008). "Timbuktu: Mud, mud, glorious mud". The Telegraph. Retrieved 25 February 2012. Earth Architecture, website whose focus is contemporary issues in earth architecture. EARTHA: Earth Architecture and Conservation in East Anglia, British organisation that focuses on the proper maintenance and conservation of earth buildings in a region of the UK that has a long history of building with mud. Very experienced experts are contactable and there are regular demonstrations in the area. Video showing mud brick making, mud brick building and biolytic sewerage in South Africa.